If you have further questions, please call us, send us a eMail or send request with your information. We will be pleased to offer you a switch and will check, which pressure switch we have on stock for your test. What is current to switch - up to 40 mA or in range of Ampere? Should switch point be fixed or field adjustable? Which pressure port do you reqest? You have special request for needed pressure switch regarding housing material, FDA approved parts you have to take, or you have to mount screened pressure switches? 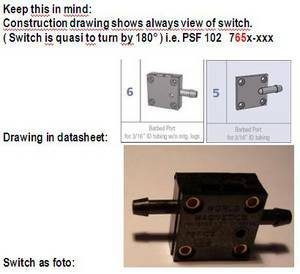 ... please get in contact with us, we will help you, to find YOUR SPECIAL pressure switch for your application.